It's been a little while since we posted, with good reason. We've been criss-crossing the country (photos coming eventually), and getting ready for a cross-country road trip. I'm working for Jerod on his bison study this summer, which is based in Saskatchewan. We spent the past three days on the road, en route from Quebec City to SK. Yesterday evening, we arrived at the cabin in Prince Albert National Park where we'll spend the next three months. The wildlife of the park gave us a fine welcome. We drove in as the sun was setting, and had a spectacular wildlife viewing evening. 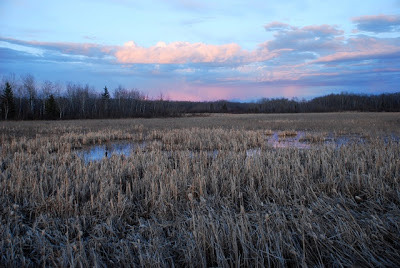 We watched blackbirds in the cattails, heard sand hill cranes, and saw loons, coots, and many other ducks on ponds formed by snow melt in farmers' fields. 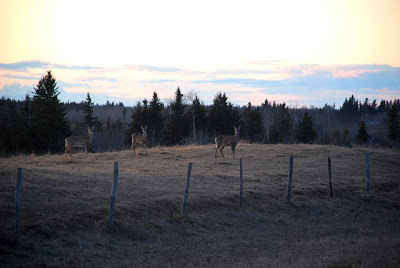 There was a welcome party of whitetail deer on a ridge, back lit by the waning light. 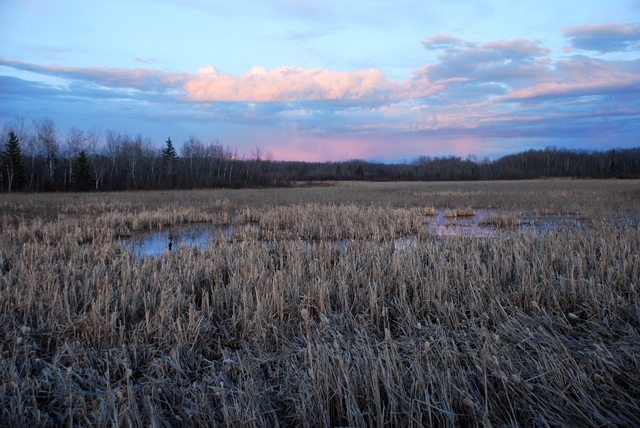 As we dropped into the Sturgeon River basin, just before the cabin, we spotted a badger, and beavers and muskrats in the river. In the other direction, a moose trotted along the edge of an aspen stand, velvety brown against the bleached white trees. The whole way, clouds danced and morphed overhead, living up to the province's nickname - Land of the Living Skies. We were surrounded by sunset - serene water along the road perfectly mirrored the sky. Waouh! You're already in the field, Jerod!!! God, summer season starts early this year :-). Well, Bethann, you're a lucky person. Enjoy your 3 months there, I really miss the place! Sau hello to "my" bison for me! Take care, my friends! Nice pictures, especially the last one by Jerod!!! Maybe you have a knack for sky pictures Jerod, I have the one of the lighthouse on the fridge. Our pleasure, of course! Can't tell you how good it feels to be OUT of the city...and to know that it will be three months before we go back. Mr. Sentz, this place is so ALIVE it is amazing! Thanks Jennie. I am not sure if it is a knack. But it sure was a beautiful sunset. Just read the article! It makes me want to be out in the woods like CRAZY! Come on over, baby! Actually, you've got some amazing woods near you. When you go exploring, I'd love to see pics.